STEVENSON, Wash. - A caravan of four exotic new sports coupes by Porsche, each driving nose-to-tail with the vehicle in front, chews up miles of rain-slick pavement draped over cliffs of the Columbia River Gorge. The road rolls over rugged terrain, threading through clefts in rock, wrapping around fir-forested hillsides, dipping low in swings down to the broad river's bank. The ground-hugging coupes flex and flow with the route, melding into a continuous form of keenly sculptured metal and precisely honed machinery. These are no ordinary drivers flying in formation ahead of this tester, who follows in fourth position. Each has earned his stripes as professional race driver for Porsche. Hurley Haywood, who has won 24-hour sieges at Le Mans and Daytona, steering countless souped-up Porsche racers, leads us. Immediately in front is Andy Pilgrim, the defending GT2-class champion for North America. Coupes in this caravan are not ordinary, either. For this run, each amounts to an entirely new generation of Porsche's icon - the venerable 911. The 1999 edition marks the first new roof-to-belly design of 911 since its introduction in 1962 at the Frankfurt Auto Show. To the designers and engineers who worked on it, the version of the Porsche 911 used in this caravan is known by the numerical badge of 996. It is, without question, the most precise and impressive Porsche ever to come from the Stuttgart crafter of precision German racing cars. Yet 996 is also a more easy-to-drive and forgiving car than any previous edition of the 911. A cursory eyeball inspection of the sleek skin might provoke anyone familiar with the 911 format to wonder if anything has changed at all. After all, the figure of this new edition, while smoothly contoured to the point of sexiness, remains essentially true to the overall shape and appearance of any former 911. However, closer examination of the components that contribute to this car's magical level of performance reveals radical new mechanical concepts at work - including a powerful new engine which uses water, not air, to cool it. Although it's still compact in size, the 911 expands in unibody structure to forge a longer and broader car whose mass hunkers a full inch closer to the pavement. Wheelbase increases by 3.2 inches, and the width grows by 1.2 inches to set up a more stable platform. The steel body of this 911, with firm lateral and longitudinal bracing in place, boosts stiffness by 45 percent, thus increasing torsional or twisting resistance, and blocks tendencies to bend by an increase of 50 percent. This rigidity ultimately translates to a smoother and more predictable ride quality. Suspension, independent at all corners with lightweight aluminum components, uses MacPherson-type struts in front and a multilink design in back, coupled to Porsche's unique Weissach wheel-toe-in, self-stabilizing correction, which creates amazingly neutral behavior when cornering. As a result, the motor-mounted tail no longer wags this rear-wheel-drive dog. And, unlike the former 911, a driver in a curve won't face the fear of that pricey rear end swinging out of control like a mass-heavy mallet twirling round and round. Actually, it settles nicely, even when hurled at speed into a too-tight bender, such as the surface of the twisty track at Oregon's Portland International Raceway - the site that served as our traffic-free venue to test 911 against its predecessor. In a corner, the suspension loads any car's weight onto outside wheels, but Porsche's suspension forces the rear wheel to toe in, so the tail remains rooted while the front wheel toes out to compensate, developing some understeer. Not that you can't trip it: In one turn, I simply lost it altogether because even a superb machine can only do so much to counter the unforgiving laws of physics. 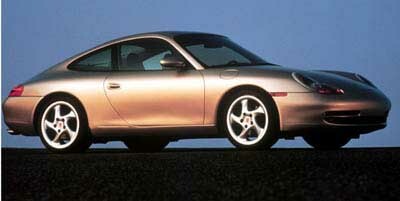 However, the balance and poise of 996 enabled this driver to recover in an instant and without an undue amount of drama. A rack-and-pinion system governs the steering, with force-sensitive power added in subtle increments. To rein in a speedy demon like this, powerful brakes must be employed - and these are big ones. The new 911 features foot-wide, cross-drilled discs supplemented by four pistons driving aluminum alloy calipers to bring to a half. They're wired to twin-path power circuits, with all action linked to computerized anti-lock controls. Pirelli P-Zero tires for the Porsche differ in size, front to rear. The standard rubber consists of 205/50ZR17 in front and 255/40ZR17 in back, but 18-inchers are an option. Then there's that aluminum hunk of motivation. Power shoots to the rear wheels from a new rear-mounted engine. It's a liquid-cooled, 3.4-liter horizontally opposed boxer six-cylinder with dual overhead camshafts, dual-stage intake system, a Bosch Motronic engine-management system and direct-ignition coil for each cylinder. Output jumps to a juicy 296 horsepower, with high torque surging throughout the midrange of engine speeds. With six-speed manual stick aboard, performance times amount to a mere 4.9 seconds when running from zero to 60 mph. Top speed pegs at 174 mph, if you dare - I didn't. Porsche's Tiptronic S automatic transmission - a dual-function, five-speed electronic shifter operating in automatic mode or clutchless manual with shift buttons mounted on the steering wheel spoke - is another choice. One other option amounts to a safety system. 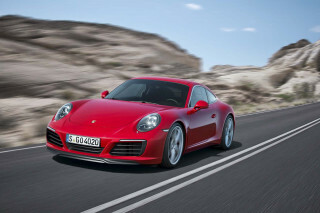 It provides traction control of Porsche's automatic brake differential to limit slip. Standard safety issues range from the steel cage encasing the cabin to four new airbags, including massive side bags designed to shield torso and head. The cockpit provides more space than was previously available, particularly for legs and heads. Bolstered sport bucket seats stand in front of two jump seats that fold to form a storage shelf. I love my car. When everything else pales in comparison, and you just have to drive your car, a love affair is in torrid progress. That's how I feel about my 911. My first Porsche was a 968. After buying the... I love my car. When everything else pales in comparison, and you just have to drive your car, a love affair is in torrid progress. That's how I feel about my 911. My first Porsche was a 968. After buying the 911, it was clear that the Deutschlander magicians have somehow managed to engineer similar ride characteristics in all of their cars. That's a feat unto itself. 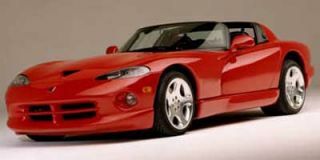 But what really sets this car apart is the ease with which one can perform regular maintenance. Everything is right there: the oil drain, the transmission drain, spark plugs, air filter and so on. In fact, many repairs aren't so complicated that even a neophyte such as myself, who gave up working n cars in the early 1990s, feels comfortable again under the "bonnet" and under the car. Ride quality is nothing short of delightful. While it picks up a lot of road noise, the sound of the engine revving high, causes my heart to pump just a little bit harder, and the smile on my face emerge into a toothy grin. Working through the gears feels like slotting a knife into a buttery smooth ice cream dish. Each gear engages smoothly with no hard notchiness, and the clutch can grab the flywheel hard when it needs to. The price on the 996 is moderate, and it provides an enormous amount of luxury and fun for the money. While some folks don't like the "fried egg" headlight units, I've found them to be a unique solution that, again, is both aerodynamic and a pleasure to maintain. The car is still all 911 in profile and looks great from the front and rear. Porsche's paint quality is another one of those touches that makes the car feel more like a beautiful design exercise than an everyday driver. But drive it everyday is surely something you can do. The 911 is a Jack of All Trades, ferrying groceries from the store, taking your child to school or going on a weekend adventure over the twisty roads that lurk nearby.